I hate spending money that doesn't need to be spent. Bread crumbs is one of the items that it seems ridiculous to pay such a high price for. I'm not sure what it costs in the grocery store but at Amazon a name brand Italian Seasoned bread crumbs sells for $4.76 for 24 ounces. Not sure about you but I usually end up with some sort of stale bread. Whether it's the crusts or leftover buns from a cookout. It all works the same. I also always have the basic herbs in my pantry so it's just easier and cheaper to make them myself. Also, I run out of storage containers too often! One day I realized that all the CoffeeMate canisters I was throwing away could be reused. I started doing this before I learned how to 'erase' the ink. As you can see it's not fancy but contact paper did a fair job of covering the print and it's easy to wipe off. 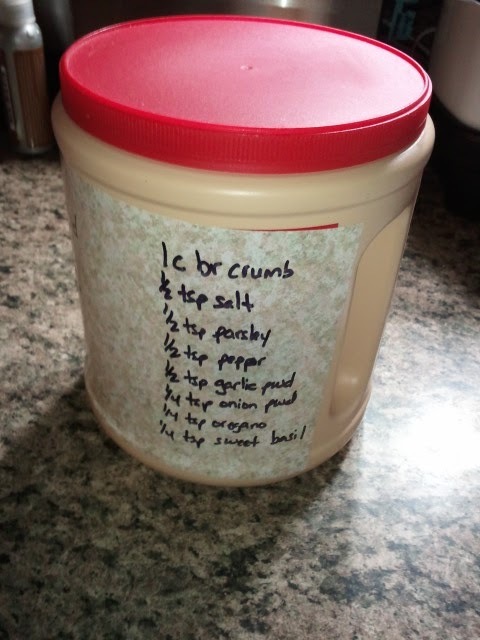 I also wrote the recipe right on the canister so it's easy to whip up another batch if I run out. 1 cup bread crumbs: When your bread goes stale just take the slices and lay on a cooking rack, cover with a towel and let them dry. Mine are usually dry the next morning. Alternately you can place them in the oven on the lowest setting or use your dehydrator. 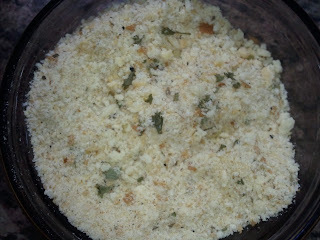 After dry toss in a baggie and roll with rolling pin to crush or toss in a food processor to make fine crumbs. Toss it all together and blend well. Make it easier and just put everything in the storage container, replace lid and shake it up. I usually make 3-4 batches at one time.